It was the first day of a Calming Signals clinic. I was talking to a group of people about leading from behind and my demo horse stood at the end of my rope, a gelding as bright as a penny. It felt like he was familiar to the people watching and they wanted to see me work with him. When that happens, it could go either way. I had a few words to say before beginning and he was restless, so I gave him a bit more room, stepping back and letting my body turn away slightly. I meant to give him room to settle but instead, he marched to a pedestal a few feet away and stepped up. It was facing the crowd and they laughed and cheered for him. Some people would love to have a horse who behaved like a self-driving car but there was something about him that made me sad. Had he repeated this trick so often that he did it by rote? Was it a free choice or a worn habit? People continued to say how special he was, and I certainly took no credit. I had done nothing, and we were not working together in the least. He shifted his feet an inch, as if to refresh the pose. That’s it; he was posing for the crowd and almost desperate for a reward. I’d seen this kind of look on a dog; that feeling that they’ve tried so hard they almost burst with the desire to please. Is this a normal behavior for a horse? It’s a valuable question in a moment like this. Sometimes what looks cute or like a funny face is one of anxiety. We can think it’s clever that a horse picks up his rope and chews on it, perhaps pretending he’s bringing it to us, when it could be a sign of something more serious. Insecurity can show as a shy unwillingness to try but also the other extreme, bravado is a kind of insecurity as well. Sometimes it shows as bully behavior, or like this horse, what we might call being “teacher’s pet.” He tries too hard, then keeps on trying. He doesn’t think he’s enough. When I begin with a demo horse on the ground, I usually ask for something with a cue I think he might not know. I’m not trying to trip him up, I hope to engage him honestly. If his owner is close, they may see what I’m asking for and tell me the cue they use to get the horse to do the behavior. It’s natural for a human to speak up, too. We humans are result oriented and any owner wants their horse to look good. How did the obstacle become more important than the conversation? How did the result become more important than the relationship? Back to the pedestal and the good gelding. I ask him to back off the pedestal by shifting my weight from one foot to the other. He poses harder, planted and uncertain what I want. A huge improvement; he’s thinking about what I’m asking. A big exhale from me, to let him know he’s on the right track. Reward a horse for thinking every time, a thinking horse is a positive horse. I shift again, this time one foot shifts back an inch and I let my weight go to that foot. He shifts his weight and he gets a huge exhale from me. Isn’t this how a dance begins? I had an idea that he was previously cued with the rope to his face, because that’s what humans do; we “talk” with our hands. Getting down from the pedestal should be the easy part, but he’s waiting to have his face pulled and I won’t. Horses begin all their movement with their feet; moving together as a herd begins with a weight shift. My feet communicate all I need them to, and I trust the gelding will hear them. Am I a genius? No, just bilingual. Meanwhile, he is locked on me, totally engaged. At this point, I have everything I want. His ears are curious, the previous anxiety is gone, and he’s focused on our conversation. Instead of an answer by rote, we’re together in this endeavor and the result doesn’t matter. I ask for his eye and he arcs his neck toward me slightly. The people watching have become invisible to him. His ears are soft, his breathing has returned. He looks, well, normal. This time my foot slides six inches back and in the same instant, on an untouched slack rope, he follows me back, matching my movement, the most natural thing for a horse to do. Now he’s on the ground facing the pedestal and I’m asking him to walk on. He can tell I don’t mean to step up again, so he waits for me to tell him right or left, to cue his face. I want a partner and that means we both get to choose, so another breath, “walk on.” A small furrow to the eyebrow and he shifts his weight just enough to loosen the front hoof closest to me. Another exhale; I want tiny bite-size answers. He wasn’t confident standing on that block earlier and I want him to know he’s getting it right, even if he’s just thinking in that direction. I’m ready for him, my weight on one foot, and when he takes that stride left, away from the pedestal, I’m out of his space and ready to go with him. 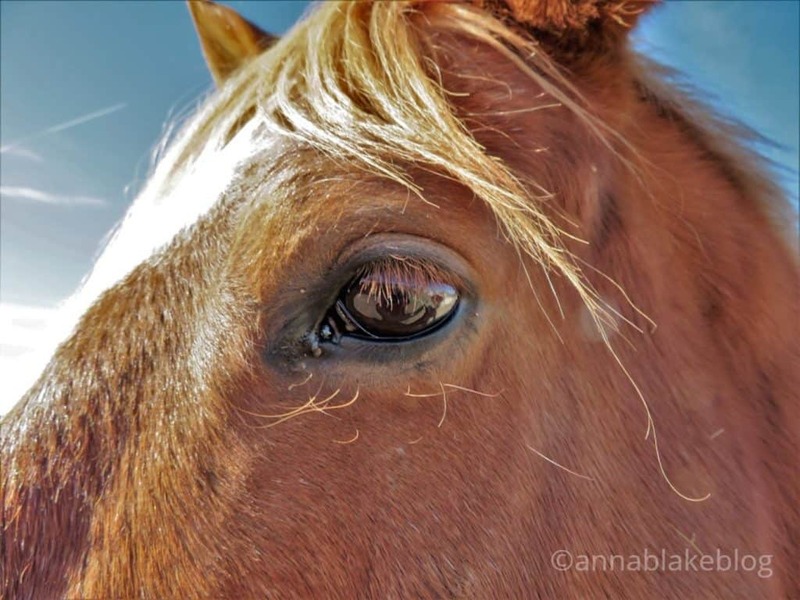 The world changes, not by huge flamboyant party tricks but by finding a small instant of oneness or connection or any of those big words that mean nothing to a horse. Bright as a penny, the gelding gives a little lick as his jaw relaxes, as eloquent as our feet to the earth. Email ambfarm@gmail.com for clinic hosting details or to be added to the email list. He gets it, horses do. Did the humans ? Beautiful. I like all the small explanations,of the little steps of progress. Happy for the horse. This is so well written and poignant! And I thought I understood horses? Different. Clear. Knowing. I’m early, before first light. Woken by more drought-breaking rain, been teeming (again) for hours. Dog barks, lights, vehicles, bosses have come to shift the calves up off the creek, which is primed to rise and isolate them. Big oilskin, Akubra, muck boots, torch, my big spotlight sees 200m. Its actually the torch I’m volunteering. Done. Count 3 short? Another look around. My torch but not my count. I can’t count cattle in daylight, let alone black calves milling about in the dark and the rain. Inside again, change duds (just the bottom 6″ wet), to find this revelation. So often you touch my soul before dawn! Thank you Anna. I don’t believe I’ve ever read anything so moving and so insightful in regards to horse training. That’s just it, you don’t train; you work with horses. The process is the most important part, I hope to say. Thank you! I know I tend to begin my comments with praise for your clarity in teaching us a new language, but wow, this was like watching a video inside my skull. Thank you. Thank you, Shelley. I work hard to ‘demonstrate’ with words. This is what we need in our lives. Thank you. This was beautiful. RIGHT??? Well, we can just do our best to pass this on now. Thank you again. This was just exactly what I needed to read. Another one knocked out of the ballpark !! I was breathing and waiting, too… . and wanting to cry with the beauty and softness of it all.. your words a perfect description of that conversation. WOW on this one! I’ve seen all this with my horses and now understand it a whole lot better. Thank you! Oh wow, so timely again! Thank you ! I would like to know that as well, Annie. So fortunate you were there for this wonderful horse. For all of us …2 or 4 footed …to be seen and heard is the best gift ever. Please keep sharing so we continue to think to learn to do better. Kelly, I love your mare! What she is doing is not really a trick, she’s one of those truly thinking horses. I wonder if she’s ever picked up something which is not yours, you’ve never touched, and doesn’t hold your scent? Anyway, keep it up, she likes to feel she’s a help. Thanks Anna for a great article. This resonated as I was teaching a beginners’ taster Horse Agility clinic yesterday and we spent most of our time on getting away from above, looking for relaxation and moving together. Willing learners but it was a really difficult concept on the ground for many. When the relationship & communication improved the obstacles became easy- they were almost incidental. I loved your clinic here in Aberdeenshire and I love your thought provoking articles. Thank you. Agree with all of the above comments. I always had the nagging thought there was something missing whenever my horse “performed” for me. You have revealed the truth, Anna. Thanks so much! Thank you, Anna! I believe I was there for that pedestal incidence – unless that has happened again somewhere else. I remember it well but having time to absorb that scene again, via your way with words, has given me much more insight and touched my heart. Boy, I finally understand what you do when you see the calming signals. The way you described everything helped me visualized the feeling I am looking for. Going to one of your clinics is on my bucket list, but in the meantime your blogs are worth their weight in gold. Thank you Anna. And I second that 100%. Thank you, Pam. Really. I am trying to get there with words…. This is fantastic. I think some humans can be the same way sometimes. You see so many people feign confidence outwardly but if you look closely they are transparent. Incredible that you can recognize this and cross the boundaries of languages to communicate with this horse and help him gain his own confidence. So true, Stephanie. Great comment. Yes! I’ve seen it so many times. Horses doing liberty work who are tight, aggressive, fearful, or emotional. People cheer and are impressed by the “relationship.” Hogwash. The horse is begging for help. Thanks for considering the ideas, Joan.